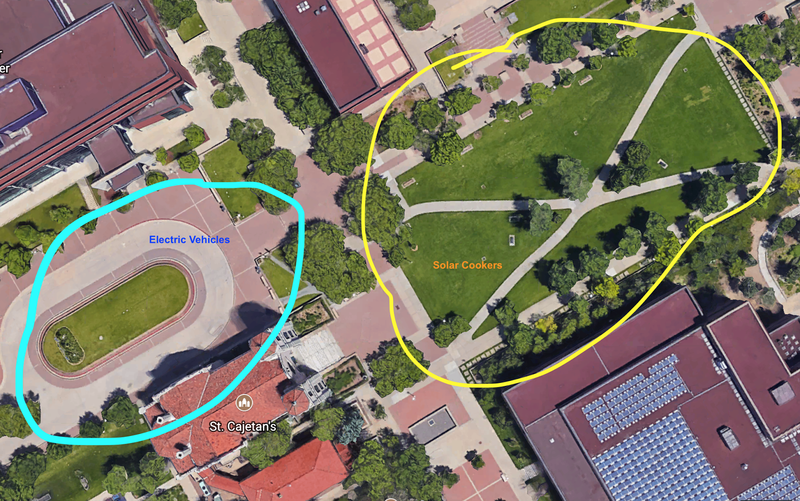 The Solar Cookers/Electric Vehicle Display event will be help October 10 and 11, Tuesday and Wednesday of the week, from 11am-3pm each day. We are looking for volunteers to display their EV and possible speak about them/answer questions for attendees. You can bring your vehicle for both days or just one, we have approved parking in the area of the event from 9am-5pm each day, but we are asking if the car owner is able to bring a tarp to place underneath their vehicle while it is on the CU Denver campus. The car will be exhibited in a round-about area on CU Denver campus, please see attached photo for exactly where. We ask that you stay with your car to be there to answer questions and allow some attendees to view the inside of the vehicle if it is comfortable with the owner. The vehicle must also be taken home over night if you decide to participate both days.